As part of your lawn care regimen you typically whipper snip the edges – this will ensure your lawn stays neat and tidy. However, even if you whipper snip, without a permanent type of edging material, your lawn can still look a bit messy. Functional – it prevents the lawn from spreading into garden beds. It also keeps soil and mulch in the garden bed. Decorative – lawn edging can add another design element to your garden landscaping. 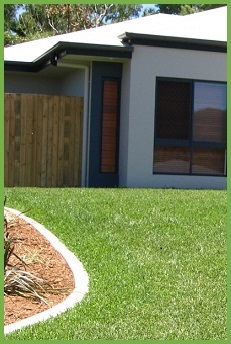 Lawn edging can be as simple as cutting a narrow empty space between the garden and your lawn. Or, it can be a more permanent material that you use. There is a huge range of materials and products available – all you need to do is find what works for your style, your budget and how easy it is to install. Regardless of the type and material you select, all lawn edging products need to penetrate the soil by at least 5-10cms to ensure that the grass roots are contained and to prevent them from spreading underneath the edge and into the garden bed. If you have a lawn variety with typically aggressive rhizomes (runners) such as Couch then you should probably have the barrier down to 15cms just for good measure. Next decision – whether your lawn edging will sit flush with the top of the height of the lawn (making it practically unnoticeable) or higher than that to be a design feature in your yard. Edging that sits flush is designed to be mowed directly over without damaging the edge or the lawn mower but ensure you install it correctly and always take care when mowing. So, choose the type of lawn edging that suits your style, taste, yard, budget and type of turf and you’ll have a neat and tidy lawn in no time at all. For all your turf needs just contact the team at Harden Park Lawns today.